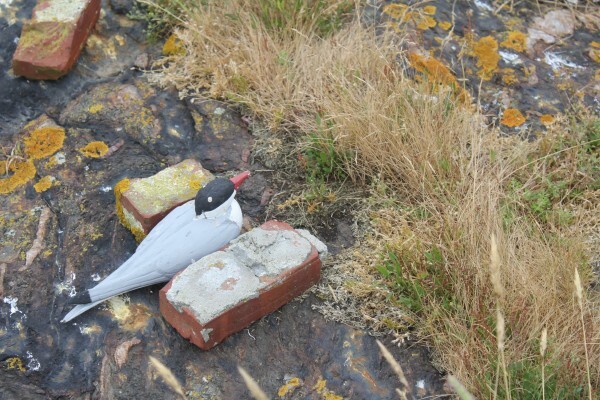 Two bricks prop up a wooden decoy tern. Interns have set up many fake birds on Metinic Island since the 1,400-seabird population abandoned the island earlier this summer. The U.S. Fish and Wildlife Service also has automated recordings of terns playing on the island to try to attract the birds back. METINIC ISLAND, Maine — For the first time in known history, the entire tern population — 1,400 at last count — abandoned this small island. In June, Maine was soaked with four rainy days in a row. Terns, seabirds that use their sight to find and dive for fish, couldn’t see their prey. Meanwhile, their No. 1 predator — gulls — also were getting hungry. The gulls usually would stalk and steal food from fishermen, but their fishing boats remained moored. On that last day of the stormy weather, the gulls infiltrated the small beach on Metinic — one of few places in Maine where the terns nest. Usually, when gulls come to eat tern eggs and devour the adults, two heroes would come to the rescue. During the nesting season, two U.S. Fish and Wildlife Service interns are stationed on Metinic to protect the rare Maine terns, sometimes by shooting gulls that terrorize them. The trouble is you can’t shoot a gun in rain, fog and 50-mph winds. They tried. “It was distressing. We were out, leaning into the wind,” said Katie Chenard, an intern for U.S. Fish and Wildlife who has spent the summer on Metinic monitoring tern populations. When the clouds cleared, it was surreal — empty. “We didn’t know what happened at first. We couldn’t process it. We thought maybe they just all went out to feed. We waited, but they didn’t come,” Chenard said. On Tuesday, Chenard walked through thigh-high grass on the island toward the tern nesting area, a pebbly shore on the island now totally birdless. Usually Chenard would have to look down, watch her step for the eggs and chicks that terns leave in the grass. Not anymore. “We’ve never lost a population on a refuge island before. We won’t know what will happen next year. It’s anybody’s guess. They likely will nest on a nearby island,” said Brian Benedict, deputy refuge manager of the Maine Coastal Islands National Wildlife Refuge. The refuge contains more than 50 islands and is managed by the U.S. Fish and Wildlife Service. He draws that conclusion in part because this has happened on a less-dramatic scale before. When Matinicus Rock had a predation issue awhile back, the birds flocked to Seal Island to mate. “Some of the terns this year did go to Matinicus Rock. We know that because they had geo-locators. They were nesting, but they were Metinic-based,” he said. Terns generally nest on only one island and there are only a few islands in Maine where the migratory birds make summer homes. They return to the same nests on the same island for their entire lives. So to relocate is a little odd for the birds. It’s unclear how many of the Metinic terns bothered laying a second batch of eggs on a new island this year. It’s also unclear whether Metinic’s terns will come back next year. This makes two rough years in a row for the terns, which last year lost about two-thirds of all their chicks because of a lack of herring, their primary food. On Tuesday on the 300-acre island — half owned by U.S. Fish and Wildlife — a speaker by the beach blasted a recording of terns on another beach from another time. In the field, black-and-white wooden birds rested as decoys. These are the U.S. Fish and Wildlife Service’s tricks. The agency wants the terns back. All 1,400 of them. “There are three [that have come back]. They just circle and circle and circle,” said Stephanie Martin of Friends of Maine Seabird Islands, a nonprofit group that helps support the on-island internship program. She looked up and saw the gray underbellies of the small birds, which let out a few caws. “They keep bringing the decoys fish,” said Michael Langlois, a biologist for U.S. Fish and Wildlife Service. “That’s part of the mating ritual. ‘You should mate with me because I can feed you,’” Martin explained. The interns have been watching the three aimless terns for weeks. The terns won’t land. They won’t nest. But suddenly, as Martin watched the sky, four more terns swooped by.